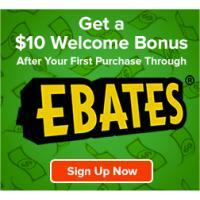 Get cash back at any of 1,800 stores any time you start your shopping trip at Ebates.com. There are no points to redeem, no forms to mail in, and no fees. Stores pay Ebates a sales commission for sending shoppers their way, and Ebates uses the commission to pay you cash back. Please click on this offer and enter your email address. Get a $10 gift card after your first purchase of $25 or more. See site for details.